The Bulldog soccer team went out firing in their 2016 regular-season finale Saturday at the Mack Chase Athletic Complex. 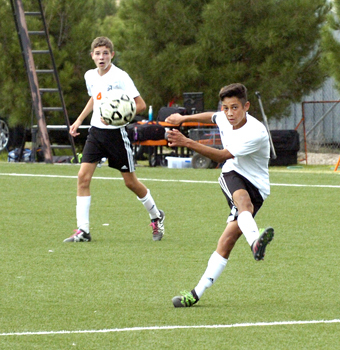 The ‘Dogs dominated possession throughout against the Warriors of Ruidoso, and the result was a 4-0 shutout in a game that saw its final 15 minutes delayed 30 by lightning. It was a solid way to usher in the second season of district play, particularly considering Artesia is still competing without the services of a large chunk of starters. “They played really well considering we still have people out,” coach Phillip Jowers said Saturday. “We could’ve made a few more passes, and there’s still some stuff we need to work on, because everything’s leading up to these next six games. The Bulldogs held the Warriors to just a pair of shots in goal in both the first and second halves of play at The Mack while racking up more than 30 of their own. Their inaugural goal came in the 21st minute on an acrobatic backward kick by Chris Reyes off the assist by Gilbert Sanchez. The ‘Dogs had plenty of other chances in the half, particularly on corner kicks, but would lead just 1-0 at the break. It took just over a minute to get things rolling in the second half, however, on a goal by Cesar Leyva, and John Baca followed with one of his own at the 15:24 mark. That 3-0 score would stand through the delay, and after resuming play, Omar Avitia rounded out the final with a goal in the 38th minute. “I thought Ruidoso did a good job,” Jowers said. “They’re a real young team, and with us having a young team over the past two years, I made sure to let their coach know to just hang with it; it’ll get better. We know how it is to have one of those seasons. It can be hard, but even though we have a losing record, our success has been measured in other ways. If you measure it in season-to-season improvement, player ability, and score lines, we’ve made a lot of progress. Artesia will kick off their District 4-AAAAA schedule at 4 p.m. Tuesday against Lovington on the road, and Jowers said the team should have a good portion of their starters back on the field. “The last game we played where we had everybody at 100 percent was Gadsden Sept. 1,” said the coach. “We haven’t even been close to 100 percent since then. The hardest part is having low numbers between JV and varsity, because when kids have to play both ways, it really increases the odds of getting hurt.